2011-2015: when I moved to Portugal in 2011 to join the laboratory of Professor Bruno Silva-Santos at IMM, I developed a growing interest for the “innate-like” population of T cells that express a gamma delta TCR (γδ T cells). In Bruno’s lab it is really easy to get passionate about γδ T cells! They are the main toys of the group and they are studied in steady state for ontogeny and homeostasis as well as in many different types of immune responses such as infections, autoimmunity and cancer. In this favorable environment, my projects aim at identifying new molecules and mechanisms that will help us understand the way γδ T cells are immediate effectors in vivo, notably in producing the pro-inflammatory molecules interferon-gamma (IFN-γ) and interleukine-17 (IL-17). Our knowledge about γδ T cells, (which were discovered in 1984), lags behind that of conventional CD4 and CD8 T cells, because in blood and lymphoid organs they only represent a small subset of T cells. By contrast, they are found at high abundance in the gut mucosa and the skin. γδ T cell main characteristic is that they exit the thymus and colonise secondary lymphoid organs already all set to immediately respond to stimuli by secreting IFN-γ or IL-17 (1). This strikingly contrasts with CD4 T cells which require prolonged cytokine-driven polarization to secrete thee pro-inflammatory cytokines. This specific feature of γδ T cells earned them the noble titles of “first line of defense”, “bridge between innate and adaptive responses” or the warrant of the “lymphoid stress-surveillance”. This is rightly deserved since γδ T cells play protective roles in many infections including M. tuberculosis, E. coli, Listeria, Plasmodium, Leishmania, Salmonella. Like CD4 T cells, γδ T cells participate to the development of autoimmune pathologies, such as experimental autoimmune encephalomyelitis, collagen induced arthritis, psoriasis, uveitis and keratitis. They have also been shown to have anti-tumoral properties in some cancer model systems studied (2) although in some circumstances when producing IL-17 they display pro-tumoural functions (3). Finally, γδ T cells can act by directly influencing adaptive immunity, for instance by amplify IL-17 production by CD4 T cells and thus exacerbating autoimmune encephalomyelitis. Thus, my goal was to get insights into the molecular pathways that control the production of cytokines by γδ and CD4 T cells in vivo during immune responses (4-6). Indeed, it is still unclear as to whether these two cell-types follow similar or distinct rules. Identifying the intrinsic and extrinsic molecular mechanisms that selectively control cytokine production by γδ or CD4 T cells is essential to envisage manipulating immune responses in vivo. We found that the regulation of IFN-γ-producing CD27+ and IL-17-producing CD27- γδ T cell subsets operated at the epigenetic level (4). In addition, they share with CD4 T cells the dependence on the master transcription factors T-bet and RORγt for IFN- γ and IL-17 production, respectively. However, the auxiliary transcription factors Eomes for IFN-g production and RORα and BATF for IL-17 production are fully dispensable for the respective gd T cell effectors (5). Finally, post-transcriptional fine tuning of the plasticity of the IL-17 producing γδ was shown to be controlled by a microRNA mRNA 146a (6). On the long term this work should open up novel ways of to either induce desirable γδ and CD4 T cell responses such as during infection and cancer (IFN-γ), or moderate γδ and CD4 T cell responses when this produces harmful effects such as autoimmune disorders or cancer (IL-17). 1. K. Serre* and B. Silva-Santos*. “Molecular mechanisms of differentiation of murine pro-inflammatory γδ T cell subsets” Frontiers in Immunology (2013) 4:431. View this article online or download the PDF. 2. B. Silva-Santos*, K. Serre* and H. Norell (2015). “γδ T cells in cancer”. Nature Reviews Immunology 15: 683–691. View this article online or download the PDF. 3. S. Mensurado, M. Rei, T. Lança, N. Gonçalves-Sousa, H. Kubo, K. Serre* and B. Silva-Santos* (2018). “Tumor-associated neutrophils suppress pro-tumoral IL-17+ γδ T cells through induction of oxidative stress”. PLOS Biology 16(5). View this article online or download the PDF. 4. N. Schmolka#, K. Serre#, A.R Grosso, M. Rei, D.J. Pennington, A. Gomez and B. Silva-Santos. “Epigenetic and transcriptional signatures of stable versus plastic differentiation of proinflammatory γδ T cell subsets” Nature Immunology (2013) 14: 1093–1100. View this article online or download the PDF + supporting information. 5. J. Barros-Martins, N. Schmolka, D. Fontinha, M. Pires de Miranda, J.P. Simas, I. Brok, C. Ferreira, M. Veldhoen, B. Silva-Santos*, K. Serre* (2016). “Effector γδ T Cell Differentiation Relies on Master but Not Auxiliary Th Cell Transcription Factors”. J Immunology 196(9):3642-52. View this article online or download the PDF. 6. N. Schmolka, P.H. Papotto, P. Vargas Romero, T. Amado, F.J. Enguita, A. Amorim, A.F. Rodrigues, K.E. Gordon, A.S. Coroadinha, M. Boldin, K. Serre, A.H. Buck, A.Q. Gomes and B. Silva-Santos. (2018). “MicroRNA-146a controls IFN-γ production and functional plasticity in γδ T cells by targeting Nod1.” Science Immunology 3(23). View this article online or download the PDF. 2002-2011: During my first post-doc at the MRC centre for immune regulation (University of Birmingham, United Kingdom) my research focused on studying CD4 T cell differentiation and how they take part in B cell responses in vivo. This research has shown that mice infected with live-attenuated Salmonella typhimurium mount a strong Th1 type of immune response that is characterized by the induction of IFN-g by T cells and the production of IgG2a antibodies by B cells (1-3). This T-dependent antibody response is associated with a massive early extrafollicular response, whereas germinal center formation is delayed until 1 month after infection (1). By contrast, in responses to alum-precipitated proteins naive CD4 T cells develop Th2 activities, up-regulating one or more of the following cytokines IL-4, IL-13, IL-5, GM-CSF, IL-3, and the transcription factor GATA-3 (3). 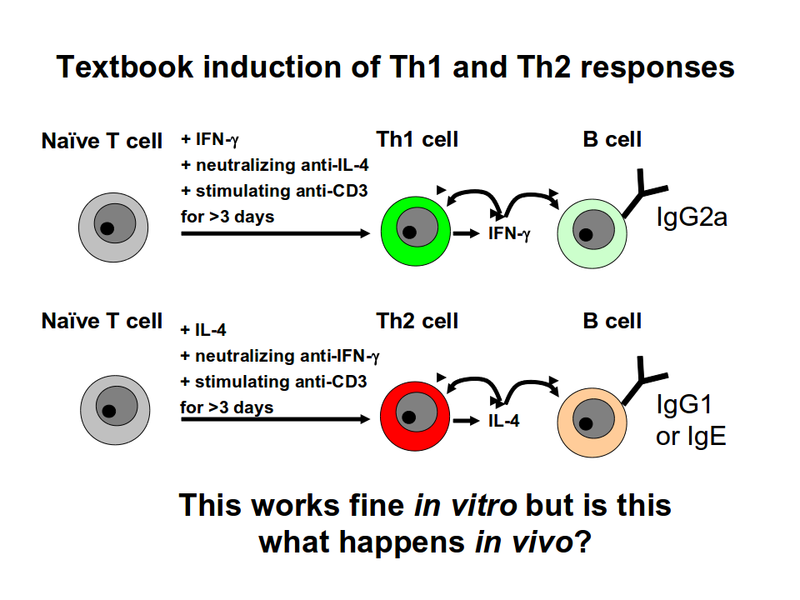 In this response, there is selective T-dependent switching by B cells to IgG1 and IgE (4, 5). This T-dependent antibody response is characterized by parallel extrafollicular plasmablast growth and germinal center formation (5). Most of our knowledge of CD4 T cell and B cell acquisition of effector functions was deducted from in vitro experiments, where these cells were subjected to cytokines effect in culture (see left cartoon). For instance, our understanding of IL-4-induction in CD4 T cells has been largely provided from in vitro cultures where T cells are stimulated through their T cell receptor and costimulatory molecules in the presence of IL-4. 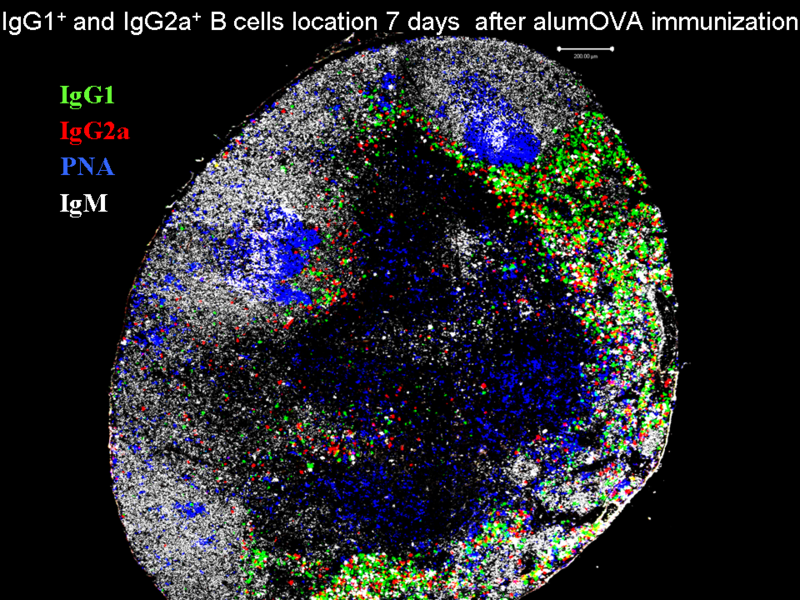 In the same way, B cells stimulated in the presence of IL-4 are induced to switch to IgG1 isotype immunoglobulins. However, it is extremetly important to conduct experiment both in vitro and in vivo. Indeed, there is evidence that the molecules involved in IL-4-signalling and that are key to the differentiation of IL-4-producing Th2 cells in vitro are dispensable in vivo. 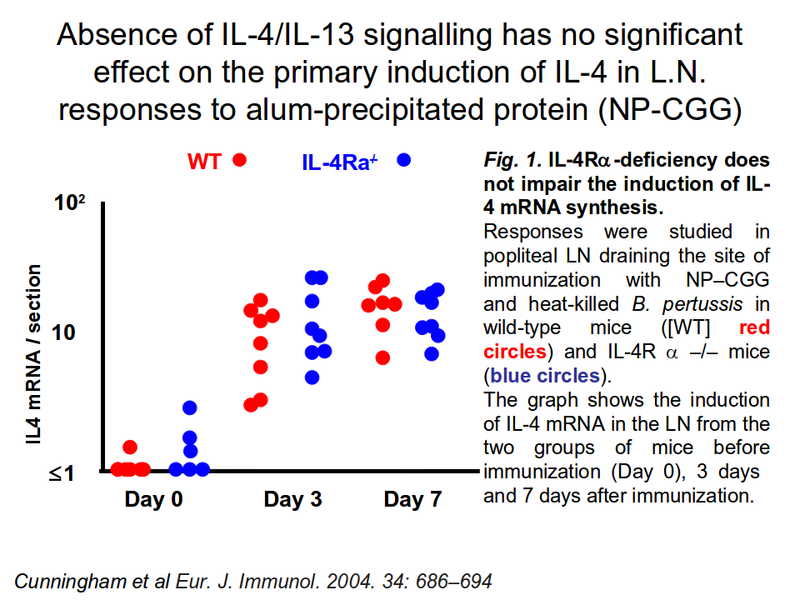 Several laboratories, including our own, have shown that mice lacking IL-4/IL-13, or IL-4 receptor a chain, or STAT6 are able to respond to Th2-antigen by up-regulating IL-4 mRNA and protein as efficiently as wild-type mice (Fig. 1) (4, 6). 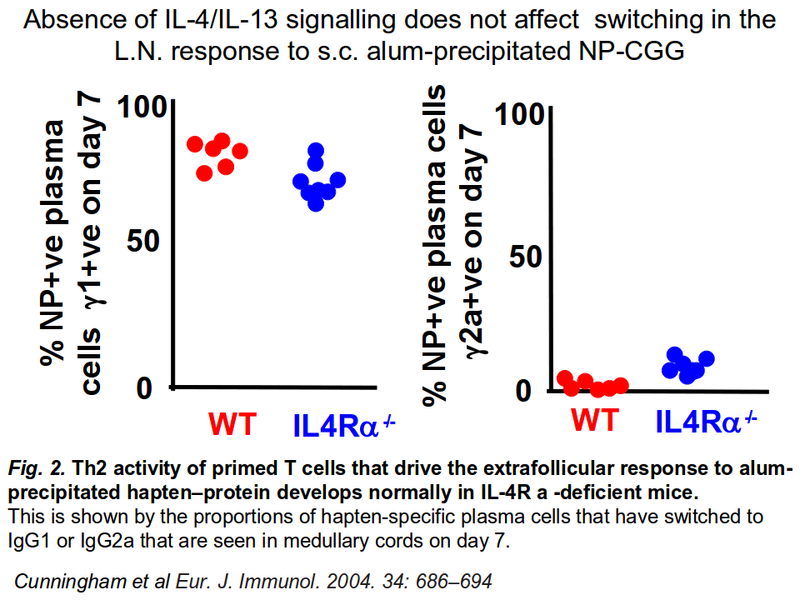 In addition, early switching to IgG1 by B cells is unaltered in these mice lacking IL-4 signalling (Fig. 2). These data have prompted me to look for what, if not IL-4 itself, triggers IL-4 in vivo. Gene expression analysis of CD4 T cells primed in vivo reveal that both Helios and IL-17RB are selectively up-regulated in CD4 T cells during responses to alum-precipitated antigen, but are not induced in cells responding to Salmonella infection (1). In addition, the expression of these three molecules is not dependent upon IL-4-signalling for they are not induced in T cells responding to TCR and IL-4 stimulation in vitro. 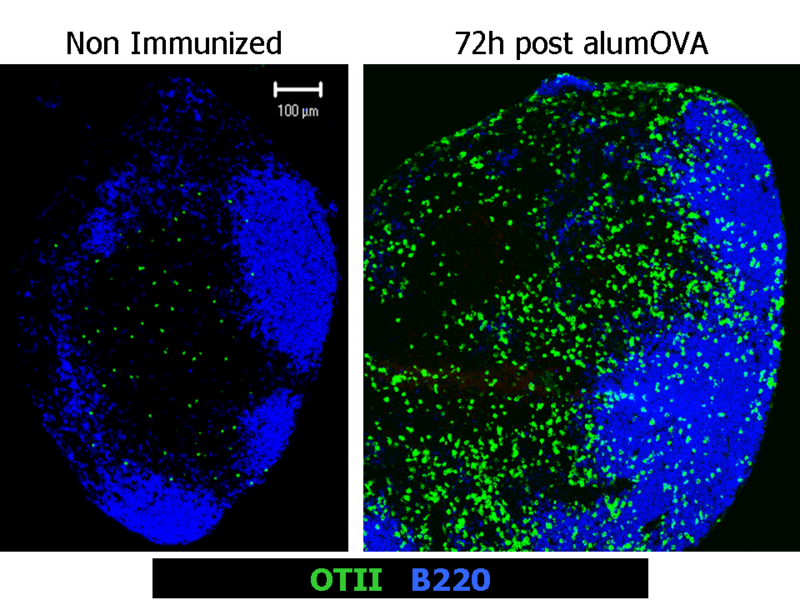 These results suggest that alum-vaccine may promote the induction of IL-25 possibly by dendritic cells, and this in turn may trigger the expression of NF-kB1 and Helios in the responding CD4 T cells thereby regulating their differentiation to IL-4-producing cells. Further studies are warranted to assess these hypotheses. 1. Cunningham, A. F., F. Gaspal, K. Serre, E. Mohr, I. R. Henderson, A. Scott-Tucker, S. M. Kenny, M. Khan, K. M. Toellner, P. J. Lane, and I. C. Maclennan. 2007. Salmonella Induces a Switched Antibody Response without Germinal Centers That Impedes the Extracellular Spread of Infection. J Immunol 178:6200-6207. 2. Cunningham, A. F., M. Khan, J. Ball, K. M. Toellner, K. Serre, E. Mohr, and I. C. Maclennan. 2004. Responses to the soluble flagellar protein FliC are Th2, while those to FliC on Salmonella are Th1. Eur J Immunol 34:2986-2995. 3. Serre, K., E. Mohr, K. M. Toellner, A. F. Cunningham, S. Granjeaud, R. Bird, and I. C. MacLennan. 2008. Molecular differences between the divergent responses of ovalbumin-specific CD4 T cells to alum-precipitated ovalbumin compared to ovalbumin expressed by Salmonella. Mol Immunol 45:3558-3566. 4. Cunningham, A. F., K. Serre, K. M. Toellner, M. Khan, J. Alexander, F. Brombacher, and I. C. MacLennan. 2004. Pinpointing IL-4-independent and IL-4-influenced acquisition and maintenance of Th2 activity by CD4 T cells. Eur J Immunol 34:686-694. 5. Mohr, E., K. Serre, R. A. Manz, A. F. Cunningham, M. Khan, D. L. Hardie, R. Bird, and I. C. MacLennan. 2009. Dendritic cells and monocyte/macrophages that create the IL-6/APRIL-rich lymph node microenvironments where plasmablasts mature. J Immunol 182:2113-2123. 6. Cunningham, A. F., P. G. Fallon, M. Khan, S. Vacheron, H. Acha-Orbea, I. C. MacLennan, A. N. McKenzie, and K. M. Toellner. 2002. Th2 activities induced during virgin T cell priming in the absence of IL-4, IL-13, and B cells. J Immunol 169:2900-2906. CD4 T cells primed to a primary single immunization show extensive diversification in their response more. I have assessed the response of antigen-specific CD8 T cells to alum-precipitated protein antigen more. 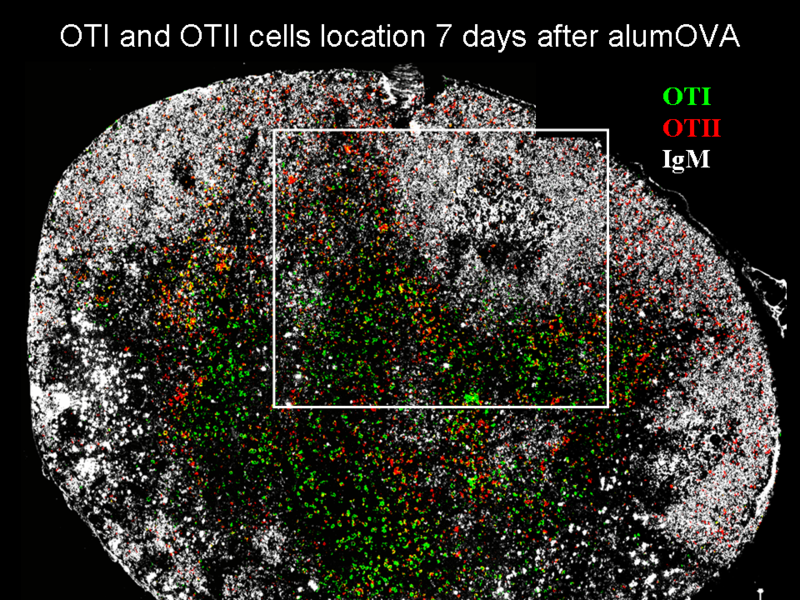 In collaboration with Dr. Elodie Mohr, we have monitored the influence of antigen specific CD8 T cells on the B cell responses to alum-precipitated protein antigen more.